Today we’re joining forces once again with the Growing with Science blog to invite you to learn more about composting. We’ll focus on worm composting, or vermicomposting, here at Share it! Science. Hop on over to Growing with Science for some fun decomposition and compost critter activities. You’ll also want to check out this excellent children’s book list on composting and decomposition. 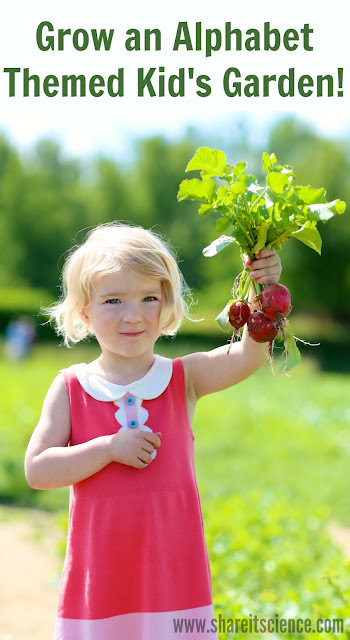 Composting is an excellent activity for children. It’s not only a good environmental practice but there are so many lessons to be learned. How do nutrients get recycled? What is decomposition? What is the difference between insects and other arthropods? Why are worms so helpful? The great thing about compost is that it can be accomplished on a small or large scale. For home gardens and classrooms small scale composting is easy to start and will keep kids engaged throughout the entire year. Worm composting is one excellent way to introduce children to the composting process. Maintaining a worm bin is simple, it creates little to no odor, and you will always have a supply of worms for some hands-on learning! You can easily build your own worm bin, or you can purchase one. I inherited a Worm-A-Way bin filled with worms when I took on my teaching job. It was an excellent little worm bin and we maintained worms in the classroom with this set-up successfully for 7 years. (When issues arose, it was my fault, which I will explain later!) Currently, this bin is unavailable through Amazon, but you can find many other alternatives there with good reviews! If you are interested in building your own bin, like this one that we keep in our basement at home, it is fairly simple. We purchased a plastic storage bin and drilled some holes towards the top for ventilation. We also covered our holes with some screening, as an extra precaution for worm escapes, but under good conditions worms won’t bother traveling. Drainage is key! We drilled a hole towards the bottom of the bin to be able to drain liquid out of the composter if necessary. We plugged up the hole with a rubber stopper. In a household of 2 science teachers, finding a rubber stopper was easy, but if you don’t have this type of supply readily available, you can purchase them very inexpensively here. You can see that we weren’t happy with our first attempt, so we ended up creating a second hole. Worm bins need to stay damp, but not too wet. This liquid is excellent fertilizer, and any that builds up in your bin needs to be drained out. Your worms will need some bedding. We use shredded recycled paper or newspaper. If you do this, I recommend trying to avoid using paper with a lot of colors and dye on it. This is a great way to recycle all those pre-approved credit card deals you get in the mail! You can also use peat moss or coconut fiber (coir) as bedding. Worms aren’t like us; they don’t have teeth to grind their food. Instead worms grind their food with the strong muscles in their gizzard. Your worms will need a bit of garden soil to provide some grit to help them grind their food. Once you have a well-established bin, they will find what they need there and you won’t need to add more soil. Now the most important part: the worms! You can’t put just any old worm into your bin. Not all worms are suited for recycling waste and living in this situation. The best worms for small vermicomposting operations like yours are Eisenia fetida, otherwise known as the red wiggler. These are epigeic worms, meaning they live in decaying organic material, not soil. Earthworms that you may find in the soil of your garden are endogeic worms. This means they spend most of their time in the soil among plant roots. Earthworms do not do well in the worm bin! Red wigglers are small worms. You can find them in nature in organic-rich areas like compost heaps and in cow pies. Don’t worry, if you are not inclined to harvest some worms from a cow pie, you can also purchase Eisenia fetida from many online retailers or home and garden stores. You might try these to get you started. If you know someone who has a healthy worm bin, you can also adopt some of their worms. Once your worm bin is chugging along, you’ll be able to return the favor. Please note: If you are looking to compost on a large scale, an outdoor compost bin will serve you better than a small worm composter. Vermicomposting is excellent for small batches of food scraps and for educational purposes. So you’ve got the bin, and you’ve got the worms. Now what? I’ve read many times that one pound of worms (about 1,000) can eat up to half a pound of food waste per day. I’ve never tried to count my worms, but even when my worm bin is at its healthiest, this amount of food seems to be a little too much. Balance is key in this micro-ecosystem. The amount of food that is transformed into worm castings that your garden and house plants will love, will vary based on a variety of factors. Worms plow through food more quickly when it is in smaller pieces. Kitchen scraps work well. You most likely will find that you’ll need to experiment with your bin to find the right ratio of food to worms. You can feed your worms fruit and vegetable scraps, shredded paper, coffee grounds, eggshells, plain rice, pasta or bread. Avoid food scraps that have oils or dressings. Keep dairy products out of your worm bin, as well as meat or bones. Don’t feed them glossy or waxed paper. Never use your worm bin to decompose pet waste, as animal feces can contain harmful bacteria and parasites. Worms are not difficult to keep alive, however, the conditions in your bin do need to stay balanced. As I have mentioned before, worms need to stay moist, but not too wet. Too much moisture is one of the biggest issues I have run into with vermicomposting. Your worm bin should never have an unpleasant odor. If it does, it probably means that it is too wet or too much waste has built up. The one time my bin failed was because I did not take the time to empty it and refill with new bedding when I should have. When things went wrong, they went really wrong and the entire bin was a loss. That said, this won’t happen to you as long as you pay attention to a few things. The first is that you are not overfeeding the worms. When you put food scraps into the bin, cover them with bedding. If those scraps are not gone the next time you go to put food in there, do not throw a lot more in. Once your worms grow in population, you’ll notice the food scraps will go more quickly and you will have a better idea of how much your bin can handle. If there is any build-up of liquid, simply drain the bin out and add some more bedding. This excess moisture can cause worms to drown, food waste to spoil and other unpleasantness. Your bin should never have a foul smell. If it does, then this is most likely your problem. If your worms begin to jump ship, you also have a problem. Happy worms will stay put where their food and bedding is. If you notice your worms crawling out, or staying high up on the walls of the bin the conditions are not right in there. Check to be sure that it is not too wet, and that it is not dried out in the bin. If wet, drain, and if dry add some bedding that is damp (not dripping!). You might find over time that you have other critters in your bin. If you use thick bedding and only add scraps fresh from the kitchen (rather than outdoor plant material) you won’t have too many problems. Fruit flies and small white worms in the bin are harmless. If you find you have larger insects, you may want to clear the compost out of the bin (see how below) and add fresh bedding. Some insects can harm your worms. When the bin begins to fill with worm castings it is time to harvest your black gold and use it in your garden and houseplants. Here are several great ideas for using your worm castings. Kids love to help with this process. I’ve had students sort through piles of vermicompost and gently put the worms back into the bin and keep the castings out. This does take a while, but if you are working in a classroom it can be a quick process. If you plan ahead, you can make the bin cleaning process very easy. Scoop the contents of the bin to one side. Put fresh food and bedding on the empty side. The worms will begin to migrate to where the new food and bedding is. Within a week or two the worms will mostly be on the side with the bedding and you can scoop out the compost without losing too many of your wigglers. What Can You Learn from Worms? It is always handy to have some worms available in your science classroom or for learning at home. Students can observe their locomotion and habits. They are useful in teaching how to be gentle and respectful of living things. Worms are excellent to introduce decomposition and how the Earth recycles nutrients. 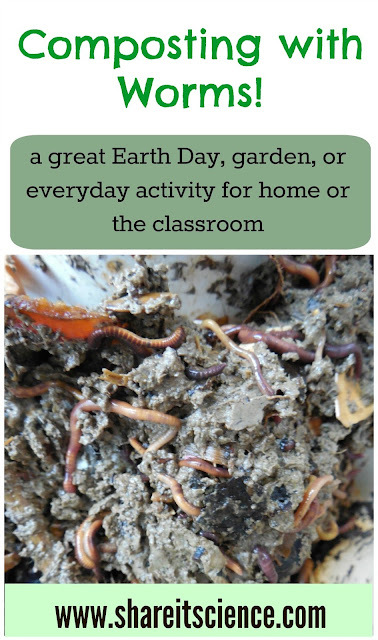 If you scoop out some worms and compost you can challenge kids to make great observations. What do they see in the compost? What parts of the food waste are left behind while others quickly decompose? 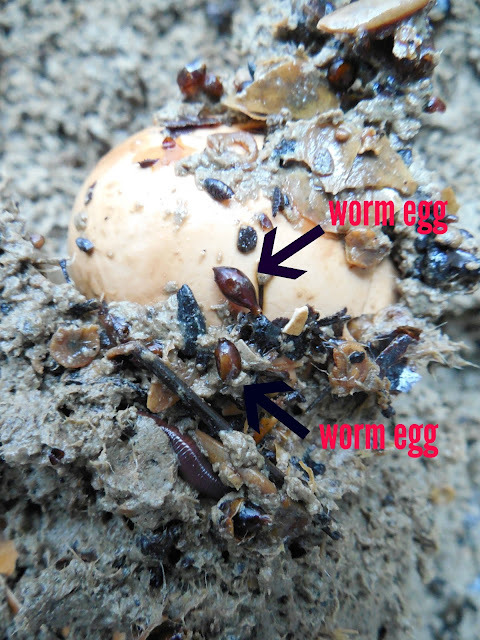 Can you find a worm egg? Wiggling Worms at Work by Wendy Pfeffer This book outlines the importance of worms and the basics of their daily lives in beautiful paper collage illustrations. Excellent for elementary students! Diary of a Worm by Doreen Cronin Kids love this book. It is a humorous fictional story, and gives ample opportunity for comparing a cartoon worms to real worms. 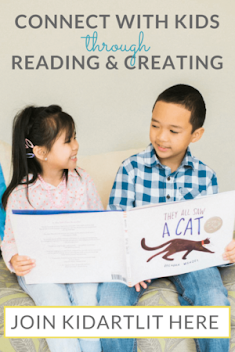 I’ve also used it to create a reader’s theater activity for second graders. Compost Critters by Bianca Lavies This picture book is laden with excellent photographs of the different organisms that work as decomposers. Once you’ve learned about worms, you’ll want to learn more about these other awesome critters as well! Worms Eat Our Garbage: Classroom Activities for a Better Environment and Worms Eat My Garbage: How to Set Up and Maintain a Worm Composting System, both by Mary Appelhof. These are the quintessential guides to setting up a worm bin and using it as a teaching tool. I love seeds! All the different shapes, the variety, the adaptations for survival, they are all pretty amazing. When learning about seeds with kids, one of my favorite picture books to read is the beautifully illustrated story, The Dandelion Seed, by Joseph Anthony and illustrated by Cris Arbo. The story follows a hesitant dandelion seed as it floats away from its plant in the fall. Throughout its adventure it passes through the 4 seasons, by cities and countryside until eventually it comes full circle and grows into a dandelion plant. This plant makes seeds as well that head off on their own adventures on the last page. The book is a great entry point to many science topics including plant life cycles, seasonal changes and plant adaptations. 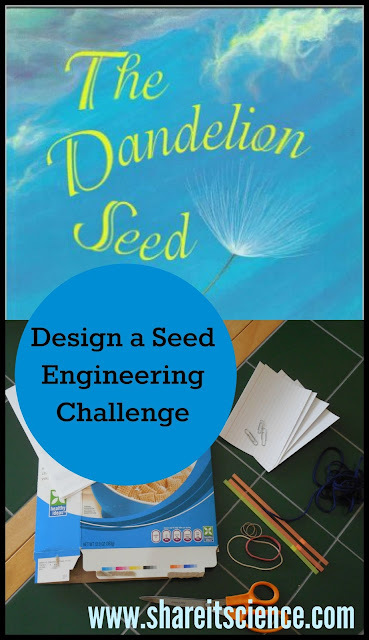 The topic of plant adaptations leads us to a fun engineering challenge: design a seed! Some seeds fly in the air, some float in the water. Some stick to the fur of animals, our socks and pants to get from one place to another. Some even must be digested before they can grow! The engineering challenge will be to design three different seeds and test out their abilities. You'll design one that is meant to fly in the breeze, one that will float in water, and another that will stick to something fuzzy. You can use any household materials for your design challenge. I suggest items such as: scrap paper, box board (cereal boxes, cracker boxes etc.) drinking straws, string, 3x5 index cards, rubberbands, paperclips and scissors. To make it more of a challenge do not include tape, glue or velcro in your supplies. Although most seeds are fairly small, your designs can be as big as you'd like, as long as they float, fly and stick you've accomplished your goal! How did your seed do? Do you need to redesign and try again? You can test your floating seed in the sink, a basin or the bathtub. Find a fuzzy blanket, fleece jacket, or patient pet to test your sticky seed out. How well do they work? It is okay to tweak your design, that is what professional engineers do! Once you are finished, you might want to learn more about seed adaptations. What different shapes do seeds come in? Can you find any that look like the seeds you created? I suggest picking up a copy of Flip, Float, Fly: Seeds on the Move by JoAnn Early Macken, illustrated by Pam Paparone. This colorful story with fun text describes how many different types of seeds travel, with an example of each. Who knows, maybe it will inspire a new seed design challenge? Another excellent non-fiction picture book is How and Why? Seeds Travel by Elaine Pascoe with photographs by Dwight Kuhn. This book has great close-up photography of seeds on the move and their growth and development. It wraps up with some additional learning activities to try. If you enjoyed The Dandelion Seed, you'll also like the Joseph Anthony's second story about dandelion seeds, The Dandelion Seed's Big Dream. This one follows a seeds plight through some tough conditions before its dream comes true, to grow into a flower. Some science ideas here are persistence in nature, plant adaptations and life cycles. There is also a nice section in the back of the book with some scientific information about dandelion plants. 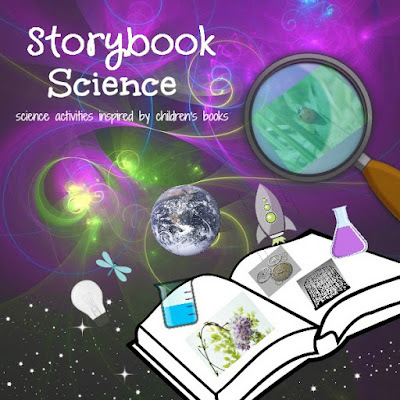 If you love books and science, then you definitely will enjoy the Storybook Science series at Inspiration Laboratories! NASA astronaut, Scott Kelly, is coming home after spending a full year in the International Space Station. Although the portion of this mission and scientific study from Low Earth orbit is concluding, there is still much that will be learned. 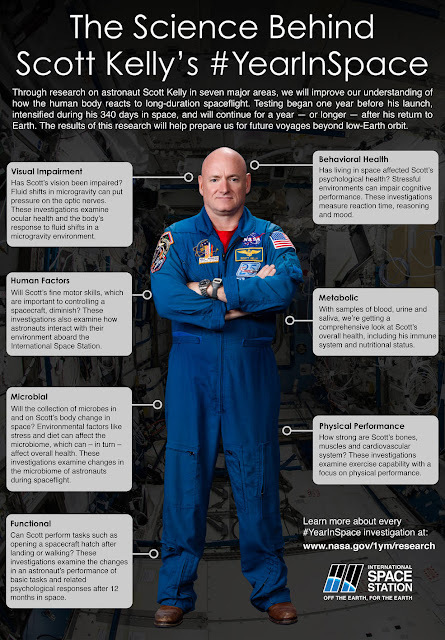 Scott, and his identical twin brother, retired astronaut Mark Kelly, participated in the mission to determine some of the long-term effects of space on the human body. The information collected throughout this year and the follow-up to it will be critical in understanding the risks and feasibility of a Mars mission. As usual, there is a ton of info out there to wade through. Here are a few quick links that will get you up to speed on this mission. First of all, during the next few days (March 1st-4th 2016) NASA TV will be covering Scott Kelly’s return from space. Follow this link for a full schedule of coverage. NASA TV is a great resource for home or the classroom. From live feeds of spacewalks and launches to important press conferences, there are lots of interesting things going on all of the time! Here are NASA’s “10 Thing You Need to Know” about the Year in Space mission. Scott Kelly took some amazing photos while he was living in the space station. Check out this link for the best pictures from his year in space. Time for Kids covered many milestones throughout this mission. 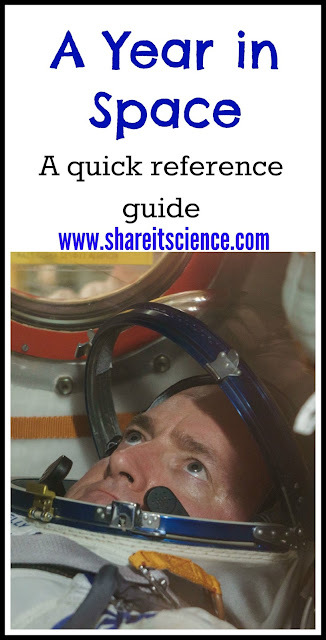 You’ll find some great science articles written for kids here. Including “My Dad is Out of This World” by Charlotte Kelly, Scott’s daughter. 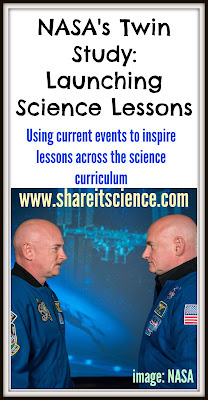 If you are looking for resources and more information about how to teach or share Scott Kelly’s mission with children check out my post, “NASA’s Twin Study: Launching Science Lessons”. Stay tuned…it will be fascinating to see the human physiology research that comes from this study! A great infographic about the human physiology questions that may be answered through Kelly's research (click image to see full size) and the landing video!